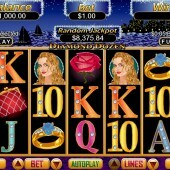 Taking a similar line to high-life slots like IGT’s She's a Rich Girl and Microgaming’s lush Finer Reels in Life, RTG’s Diamond Dozen sees you plunged into a nighttime city-scape where money talks and diamond rings are the norm. The game concerns a beautiful woman and her lothario suitor, with a diamond engagement ring, red rose, silk purse, and classy-looking 9-through-Ace accompanying them on the five reels. 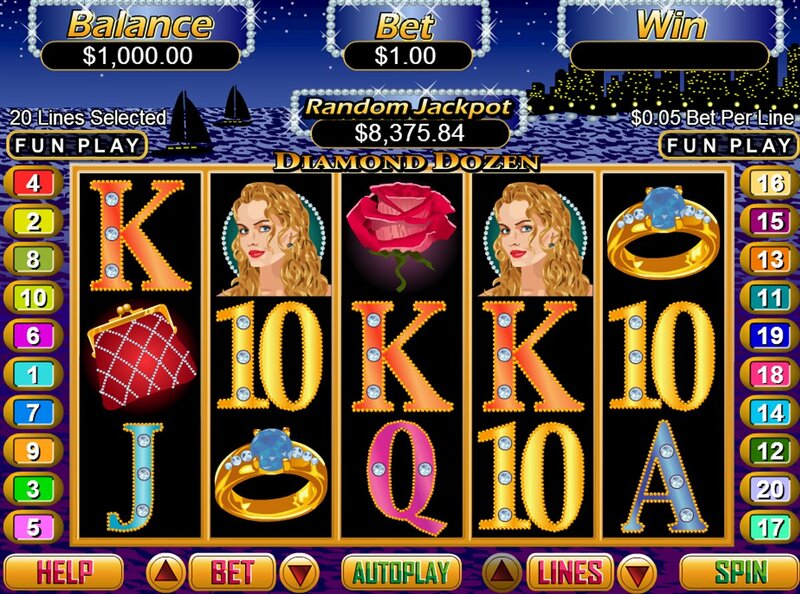 This is only 20 pay-lines compared to some of the 25 pay-line games in slot developer RTG’s series, but with line bets starting at just $0.03, all wallets are catered for. The White Diamond is Wild, substituting for all regular symbols except the Scatter. Five Wilds will bag you a 3,000-coin jackpot. This tempting Wild is also a Scatter, and three or more of them across the reels will trigger the Diamond Delight bonus feature. Essentially a Click Me Bonus, each White Diamond icon will reveal a number from 1 to 10. These numbers are then multiplied together to find your multiplier. This is then multiplied by your bet to determine your win. There are free spins to be had in this game too. Hit three or more Blue Diamond Scatters left to right and you’ll win 12 free spins with a 2x multiplier added. During free spins – which can be re-triggered – extra Wilds and Scatters will be added to the reels, giving you even more chances to win some serious cash. There are certainly some quick, easy wins to be had in Diamond Dozen. The game does suffer from the classic RTG problem of the bonus rounds being a bit on the “hard-to-trigger” side, but there is a sweet randomly-awarded progressive jackpot that can hit at any time during the game, so there are definite bonuses.